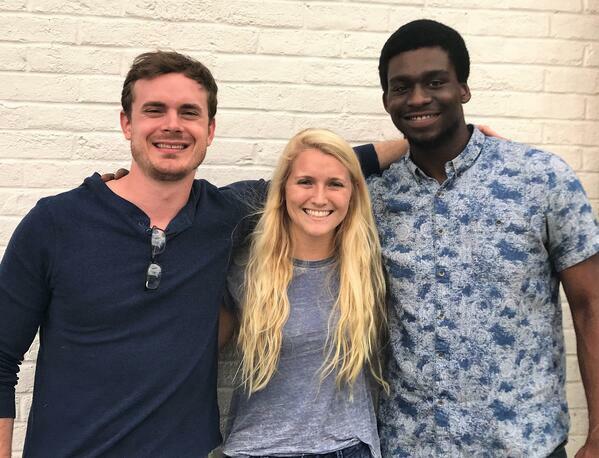 Our 2018 summer interns—April Adams, Caleb Blakenship, and Morris Eguakun—have fully embraced their internship experience, diving in and working hard from day one. They brought thoughtful perspectives and informed opinions to the table, blending right in with our culture of curiosity, innovation, and growth. April spent the summer interning with our development team learning how to use foundational programs like Django, React, and PostgreSQL, and gaining experience working on a large, mature code base with a team of developers. Caleb and Morris spent the summer interning with our Strategic Resource Group (SRG), learning the common tools of a healthcare analyst and gaining insight about targets, industry terms, and strategies. They have each grown and benefited from their internships, while providing significant value to our team. In their own words below, they reflect on their summer, summarizing their experiences, insights, and key takeaways. I graduated from Austin Peay State University this August with a master’s degree in data management and analysis and predictive analytics. My main attraction to this line of study was my interest in statistics. I was dreading the computer science side of the program, but in the end, I was surprised by how much I enjoyed that aspect of it. The final program requirement was a summer internship. As a student athlete up until the final year of my masters, with the majority of my free time spent playing sports, I realized I was on the hunt for an internship with little work experience. I was so nervous for my interview with Stratasan, but by the time it was over, there was no doubt in my mind that it was the company I wanted to intern for. When I got the call that I had the internship, I could not believe it. They took a chance on me, even though my experience in the development field was not the best. The first month or so, I learned all about the development team. Everyone was very approachable, which was nice considering I seemed to have a never-ending list of questions. Then came time to decide on my intern project for the summer. The team was open to whatever ideas I had and they provided me with plenty of suggestions. The idea that was most appealing to me was a machine learning project. The team knew that my background was more focused on statistics than computer science and this was a different direction from the original vision for the internship, but everyone was very open to the idea and curious to see the outcome. With a lot of support and encouragement, I completed the project and presented my results to the company. Before, during, and after my presentation, the curiosity and affirmation from everyone present was beyond anything I could have imagined. I have learned a variety of things, such as life lessons, coding tips, and statistics analysis throughout this process. I came in to this internship not having a clue about healthcare, and I am leaving with the intention to spend the rest of my career in the healthcare industry. I cannot thank Stratasan enough for the confidence, encouragement, and experience provided to me in the short time I was here. I was never alone throughout the process, had plenty of resources at my disposal, and mentors to confer with. Everyone was so considerate and helpful; Stratasan is truly is one big happy family. This blog post is one of the most difficult things I’ve had to write. It’s challenging to summarize the entirety of my experience here at Stratasan in a few paragraphs. Additionally, this post marks an end to my time here as an intern. But as with anything, an ending to one chapter marks the beginning of another, as I will continue to work with Stratasan once my internship is complete. For now, I look forward to sharing with you what I’ve learned this summer. As an upcoming senior studying Computer Science at Tennessee State University, I came to this internship having virtually no experience working as a data analyst, and a very narrow view of what a data analyst actually does. Thankfully, with hard work—and a lot of help from Stratasan’s Strategic Resources Group (SRG)—I now have a broader perspective of this field: what it is and why it is valuable. My time working here as an SRG intern has been mostly spent learning new things; some of which came easy, the majority of which did not. Throughout this experience, I’ve been able to rely on excellent mentors within the SRG and Customer Success teams, as well as team members from every other department of the company. One thing you’ll learn quickly at Stratasan is that everyone is a valuable wealth of knowledge. I’ve never had a question that I couldn’t get answered quickly—either by sending a quick message on Slack, or by asking the person beside me. In my opinion, one of the strongest assets at Stratasan is its diverse and skillful team. Working with Stratasan’s software tools—Blackbird and Canvas—has given me hands on experience with a variety of data sets. Various projects provided me the opportunity to work with multiple team members toward a common goal. Every project has given me a great deal of insight into how analysts use data to make important decisions in order to meet the needs of the client. When I came to Stratasan, I expected to learn many new things about being a data analyst; however, there were a few times where I found myself learning something I didn’t expect. Whether it was sitting in on a conference call with a client, attending one of the various lunch and learns that are frequently hosted in the conference room, or simply chatting with a co-worker, Stratasan fosters a learning environment where you’re constantly picking up new and helpful information. I can confidently say that thanks to my time interning here at Stratasan, I’ve gained a better understanding of how the healthcare industry works and how to use healthcare analytics to make strategic decisions with industry impact. As my time as an intern comes to an end, I look back with fond memories. It’s been a great summer and I’m really grateful to have been afforded this opportunity. With that in mind, I’d like to thank all the wonderful people who made this internship the awesome experience that it was. I look forward to continuing my work with you all—thanks again! There were two weeks left before the spring semester would end, and I made the firm decision in my mind that I would not accept any internships. I reasoned that I needed to use this summer to study as hard as I possibly could, so I would be skilled enough to contribute to a company as an intern. My professor, Dr. Tamara Rogers, told me something in class that helped to alter my thinking in a positive way. She proclaimed, “Allow the employer to decide whether you are qualified or not.” It was in that very moment that I understood that it is unwise to reject a job that I hadn’t even been offered yet. Dr. Rogers showed me that a technology company called Stratasan was searching for interns. Even though the job opportunity may not involve computer programming, I knew that there were components to becoming a technology professional that I would not be able to learn in a programming class. I decided that it was time to get out of my comfort zone and give it a try. First, I decided to google Stratasan online, because I had never heard of a company like this one. What I saw was a company that is using technology to help hospitals and healthcare systems serve their patients and communities better. I originally became a computer science major, due to the impact that I see computers have on everyday business processes. I immediately wanted to align myself with the values of this company, specifically the idea that strategic planning and resourceful business practices can create a better community for people. I got my resume and cover letter together, sent the best email that I could to attempt to get an interview, and I was denied. After mustering up the courage to go through with this whole ordeal, I received a message stating that Stratasan had already filled their web development position for the summer. Bummer! Amid my sulking, Stephanie Johnson, reached out to me via email informing me that their Strategic Resources Group was looking for interns for the summer! I was ecstatic about the opportunity, so I took a leap of faith into the Stratasphere. The onboarding process revealed a lot about Stratasan and its culture. I was so worried about studying this summer, to be prepared to contribute to a company; however, Stratasan took me through a thorough training process where I got to gain an understanding of what everyone at the company does and how the components come together to serve different clients in the way that is most preferable to them. I enjoyed the way that the development team at Stratasan understood that I love to work with computers and they allowed me to follow along with their conversations and provided training videos, so I could continue to cultivate this passion of mine. My biggest takeaway from the training process is that Stratasan really means it when they say “our success is my success.” Every employee here plays a part in helping the growth and success of the next employee. This was my first time getting to see and experience this, as it is hard to visualize these practices in large corporate structures. Everyday as a Stratasan intern, I was able to see how the customer success team handles requests from clients and maintains strong relationships with them so they can understand what they need—sometimes better than the clients themselves. Next, SRG would take that request and employ as many brilliant minds on the project as necessary to bring the request to life. Thanks to the generosity of the development team, I was able to follow their conversations and understand how they maintain our application for internal and external usage. The development team has created and maintains one of the most powerful SAAS platforms I have ever seen or heard of. My favorite tool within the Stratasan software suite is Launch Pathway! I love Launch, because you can gather and see an abundance of insight, including demographics, maps, and market share reports broken down by product line, zip code, facility, etc. As a computer science student, it is amazing to be able to experience how these technologies fit in a business model. It allows me to understand what you must have supporting the technology, to make it valuable to a customer. You have to have a marketing and sales team to properly tell people about your products, while also having an understanding for what products companies are willing to buy. Every piece of the puzzle is critical to the full picture. Stratasan quickly started to feel like a home away from home, due to the relationships that I was able to build with my co-workers. We have four employees that graduated from the same high school as I did and that is very inspirational to me because they are key members of this organization that have all helped me tremendously since I’ve been here. I am able to talk to anyone on any level here and that is comforting. It makes me happy to know that I can talk to the CEO of our company and ask him for advice or if I am having trouble with a project, I can always recruit one of the great minds around me to assist me in my goals. I take pride in the fact that I can have genuine conversations with the leader of our team and know that she genuinely cares about my future. I love the fact that our sales and CS teams feel confident in telling our clients about all that we can do for them. It is because we all know the SRG and development team members, and we know what we are capable of. Our success is my success and our success is our client’s success. I am so glad to have stepped out of my comfort zone and taken on an opportunity that was a little outside the realm of what I am being taught to do but it is completely in line with what I love to do and will need to do, in order to have a successful professional career. My biggest advice to the next set of interns is to have faith in yourself, work hard, and don’t be afraid to take on new challenges. Stratasan has helped mold me into a better professional, a better thinker, and a better man overall. For updates about open positions and internships at Stratasan, visit our careers page and connect with us on social media: LinkedIn, Twitter, and Facebook. To learn more about Stratasan and how we can equip your team to maximize strategic growth, request a discovery call today. Part 1 of this post is by April Adams, Development Team Intern for Stratasan. April is a graduate of Austin Peay State University where she earned a Professional Science Masters with a concentration in Predictive Analytics and Data Management and Analysis. Part 2 of this post is by Caleb Blakenship, Strategic Resources Group Intern for Stratasan. Caleb is a Marine veteran and is studying Computer Science at Tennessee State University. Part 3 of this post is by Morris Eguakun, Strategic Resources Group Intern for Stratasan. Morris is studying Computer Science at Tennessee State University.